For other uses, see Truro (disambiguation). Truro (/ˈtrʊəroʊ/; Cornish: Truru) is a city and civil parish in Cornwall, England. It is Cornwall's county town and only city and centre for administration, leisure and retail. Truro's population was recorded as 18,766 in the 2011 census. People from Truro are known as Truronians. As the southernmost city in mainland Britain, Truro grew as a centre of trade from its port and then as a stannary town for the tin mining industry. Its cathedral was completed in 1910. Places of interest include the Royal Cornwall Museum, Truro Cathedral the Hall for Cornwall and Cornwall's Courts of Justice. The origin of Truro's name is debated. It has been said to derive from the Cornish tri-veru meaning "three rivers", but authorities such as the Oxford Dictionary of English Place Names reject this theory. There are doubts about the "tru" part meaning "three". An expert on Cornish place-names, Oliver Padel, in A Popular Dictionary of Cornish Place-names, called the "three rivers" meaning "possible". Alternatively the name may derive from tre-uro or similar, i. e. the settlement on the river Uro. The earliest records and archaeological findings of a permanent settlement in the Truro area date from Norman times. A castle was built there in the 12th century by Richard de Luci, Chief Justice of England in the reign of Henry II, who for his services to the court was granted land in Cornwall, including the area surrounding the confluence of the two rivers. The town grew in the shadow of the castle and was awarded borough status to further economic activity. The castle has long since disappeared. Richard de Lucy fought in Cornwall under Count Alan of Brittany after leaving Falaise late in 1138. The small adulterine castle at Truro, Cornwall (originally the parish of Kenwyn), later known as "Castellum de Guelon" was probably built by him in 1139–1140. He styled himself "Richard de Lucy, de Trivereu". The castle later passed to Reginald FitzRoy (also known as Reginald de Dunstanville), an illegitimate son of Henry I, when he was invested by King Stephen as the first Earl of Cornwall. Reginald married Mabel FitzRichard, daughter of William FitzRichard, a substantial landholder in Cornwall. The 75-foot (23 m)-diameter castle was in ruins by 1270 and the motte was levelled in 1840. Today Truro Crown Court stands on the site. In a charter of about 1170, Reginald FitzRoy confirmed to the burgesses of Truro the privileges granted by Richard de Lucy. Richard held ten knights' fees in Cornwall prior to 1135 and at his death the county still accounted for a third of his considerable total holding. By the start of the 14th century Truro was an important port, due to its inland location away from invaders, prosperity from the fishing industry, and a new role as one of Cornwall's stannary towns for assaying and stamping tin and copper from Cornish mines. The Black Death brought a trade recession and an exodus of the population that left the town in a very neglected state. Trade gradually returned and the town regained prosperity in the Tudor period. Local government was awarded in 1589 by a new charter granted by Elizabeth I, giving Truro an elected mayor and control over the port of Falmouth. During the Civil War in the 17th century, Truro raised a sizeable force to fight for the king and a royalist mint was set up. Defeat by the Parliamentary troops came in 1646 and the mint was moved to Exeter. Later in the century, Falmouth was awarded its own charter, giving it rights to its harbour and starting a long rivalry between the two towns. The dispute was settled in 1709 with control of the River Fal divided between them. The arms of the city of Truro are "Gules the base wavy of six Argent and Azure, thereon an ancient ship of three masts under sail, on each topmast a banner of St George, on the waves in base two fishes of the second." Truro prospered in the 18th–19th centuries. Industry flourished through improved mining methods and higher prices for tin, and the town attracted wealthy mine owners. Elegant Georgian and Victorian townhouses were built, such as those seen today in Lemon Street, named after the mining magnate and local MP Sir William Lemon. Truro became the centre for society in the county, even dubbed "the London of Cornwall". Throughout those prosperous times Truro remained a social centre, and many notable people came from there. Among the noteworthy were Richard Lander, an explorer who was the first European to reach the mouth of the River Niger in Africa and was awarded the first gold medal of the Royal Geographical Society, and Henry Martyn, who read mathematics at Cambridge, was ordained and became a missionary, translating the New Testament into Urdu and Persian. Others include Humphry Davy, educated in Truro and the inventor of the miner's safety lamp, and Samuel Foote, an actor and playwright from Boscawen Street. Truro's importance increased later in the 19th century, when it had an iron-smelting works, potteries, and tanneries. The Great Western Railway arrived in the 1860s, providing a direct link to London Paddington. The Bishopric of Truro Act 1876 gave the town a bishop, and subsequently a cathedral. The next year Queen Victoria granted Truro city status. The New Bridge Street drill hall was completed in the late 19th century. The start of the 20th century brought a decline in mining, but the city remained prosperous and continued to develop as the administrative and commercial centre of Cornwall. Today, Truro remains the county retail centre, but like other places, faces concerns over replacement of speciality shops by national chain stores, erosion of identity, and doubts about how to accommodate the growth expected in the 21st century. Truro lies in the centre of western Cornwall, about 9 miles (14 kilometres) from the south coast at the confluence of the rivers Kenwyn and Allen, which combine to become the Truro River, one of a series of creeks, rivers and drowned valleys leading into the River Fal and then to the large natural harbour of Carrick Roads. The river valleys form a fairly steep-sided bowl surrounding the city on the north, east and west, open to the Truro River in the south. The bowl shape, along with high precipitation that swells the rivers and a spring tide in the River Fal, were major factors in the 1988 floods that seriously damaged the city centre. Since then, flood defences have been constructed, including an emergency dam at New Mill on the River Kenwyn and a tidal barrier on the Truro River. The city is surrounded by a number of protected natural areas such as the historic parklands at Pencalenick, and larger areas of ornamental landscape, such as Trelissick Garden and Tregothnan further down the Truro River. An area south-east of the city, around and including Calenick Creek, has been designated an Area of Outstanding Natural Beauty. Other protected areas include an Area of Great Landscape Value comprising agricultural land and wooded valleys to the north east, and Daubuz Moors, a Local Nature Reserve alongside the River Allen close to the city centre. Truro has mainly grown and developed around the historic city centre in a nuclear fashion along the slopes of the bowl valley, except for fast linear development along the A390 to the west, towards Threemilestone. As Truro has grown, it has incorporated a number of other settlements as suburbs or unofficial districts, including Kenwyn and Moresk to the north, Trelander to the east, Newham to the south, and Highertown, Treliske and Gloweth to the west. Major employers in the city include the Royal Cornwall Hospital, Cornwall Council, and Truro College. There are about 22,000 jobs available in Truro, compared to only 9,500 economically active people living in the city. Commutes into Truro are a major factor in its traffic congestion. Average earnings are higher than in the rest of Cornwall. Housing prices in Truro in the 2000s were 8 or more per cent higher than in the rest of Cornwall. Truro was named in 2006 as the top small city in the United Kingdom for increasing house prices, at 262 per cent since 1996. There is heavy demand for new housing and a call for inner-city properties to be converted into flats or houses to encourage city-centre living and reduce dependence on cars. Truro's dominent feature is the Gothic-revival cathedral, designed by architect John Loughborough Pearson, rising 249 ft (76 m) above the city at its highest spire. It took 30 years to build, from 1880 to 1910, on the site of the old St Mary's Church, consecrated over 600 years earlier. Enthusiasts of Georgian architecture are well catered for in the city, with terraces and townhouses along Walsingham Place and Lemon Street often said to be "the finest examples of Georgian architecture west of the city of Bath". The main attraction for regional residents is the wide variety of shops. Truro has various chain stores, speciality shops and markets that reflect its history as a market town. The indoor Pannier Market is open year-round with many stalls and small businesses. The city is also popular for catering, including cafés and bistros, and for night life, with many bars, clubs and restaurants. Truro houses the Hall for Cornwall, a performing arts and entertainment venue. The Royal Cornwall Museum is the oldest and premier museum in Cornwall for exhibitions detailing Cornish history and culture, with a wide range of collections such as archaeology, art and geology. Among the exhibits is the so-called Arthur's inscribed stone. Truro is also noted for parks and open spaces, including Victoria Gardens, Boscawen Park and Daubuz Moors. Lemon Quay is the centre of most festivities in Truro, which attracts visitors year-round with numerous different events. In April, Truro prepares to partake in the Britain in Bloom competition, with floral displays and hanging baskets dotted around the city throughout the summer. A "continental market" also comes to Truro in the holiday-making season, featuring food and craft stalls from France, Spain, Italy, Germany, Belgium, the Netherlands, Greece, etc. Cornwall Pride, a Pride event that celebrates diversity and the LGBT community, takes place on the last Saturday of August. The Truro City Carnival, held every September over a weekend, includes various arts and music performances, children's activities, a fireworks display, food and drinks fairs, a circus, and a parade. A half-marathon organised by Truro Running Club also occurs in September, running from the city centre into the country towards Kea, returning to finish at Lemon Quay. Truro marks Christmas with a Winter Festival that includes a "City of Lights" paper lantern parade. Local schools, colleges, and community and youth groups join in. Students at the local college in Truro have created large lanterns, complementing the work of the core artists team. There are Christmas lights throughout the city centre, with a "switch-on" event, speciality products and craft fairs, late-night shopping evenings, various cathedral events and a firework display on New Year's Eve. A Christmas tree is put up on the Piazza and another outside the cathedral at High Cross. Truro was temporarily the home to the rugby union club Cornish Pirates, but the team moved back[when?] to its original base in Penzance. In April 2018, the construction of a Stadium for Cornwall was under discussion with Cornwall Council, which had pledged £3 million in funding for the £14.3m project.. It is planned for a site in Threemilestone The town has an amateur rugby union side, Truro RFC (founded in 1885), which belongs to Tribute Western Counties West and plays home games at St Clements Hill. It has hosted the CRFU Cornwall Cup several times. Truro City F.C., a football team in the National League South, is the only Cornish club ever to reach this tier of the football pyramid. The club achieved national recognition by winning the FA Vase in 2007, beating A.F.C. Totton 3–1 in only the second ever final at the new Wembley Stadium, and becoming the first Cornish side ever to win that award. Cornwall County Cricket Club play some of their home fixtures at Boscawen Park, which is also the home ground of Truro Cricket Club. Truro Fencing Club is one of Britain's flagship clubs, having won numerous national championships, and had three fencers selected for Team GB at the London 2012 Olympics. Other sports amenities include a leisure centre, golf course and tennis courts. Truro is the centre of Cornwall's local media. The countywide weeklies, the Cornish Guardian and The West Briton, are based in the city, the latter serving the Truro area with its Truro and Mid-Cornwall edition. The city also houses the broadcasting studios of BBC Radio Cornwall, and those of the West district of ITV Westcountry, whose main studio is now in Bristol after a merger with ITV West. This closed the studio in Plymouth and the Westcountry Live programme was replaced by The West Country Tonight. A mummers play text attributed until recently to Mylor, Cornwall (much quoted in early studies of folk plays, such as The Mummers Play by R. J. E. Tiddy – published posthumously in 1923 – and The English Folk-Play (1933) by E. K. Chambers), has now been shown, by genealogical and other research, to have originated in Truro around 1780. The Truro area has an oceanic climate similar to the rest of Cornwall's. This means even fewer extremes in temperature than in the remainder of England, marked by high rainfall, cool summers and mild winters with infrequent frosts. Truro City Council, a city/parish council, is based upstairs at the Municipal Buildings in Boscawen Street, and is responsible for parks, gardens and planting, mayoral and civic events, support of its overseas twinning, and tourist information. It also considers planning issues and has been involved in creating the Truro and Kenwyn Neighbourhood Plan in association with Cornwall Council. The city is divided into four wards: Boscawen, Moresk, Tregolls and Trehaverne, with 24 councillors elected for four-year terms.Cornwall Council (a unitary authority) has its base at Lys Kernow ("Cornwall Court", formerly County Hall) west of the city centre. It administers planning, infrastructure, development and environmental issues. The City Council is an elected public body forming the lowest level of government in the city. It is part of the parish council level, which comprises 213 parish bodies in the county of Cornwall. The layer of government directly above is Cornwall Council, the unitary authority for Cornwall, which is directly below central government. It maintains and is responsible for Truro's Library, parks and gardens, tourist information centre, allotments and cemeteries. It is affiliated to Truro Chamber of Commerce and other local civic organisations. Truro has been a borough since medieval times, its borough court first granted in 1153, and becoming a free borough in 1589. Truro became a city in 1877, being issued letters patent after becoming the location of an Anglican diocese in 1876, at a time when it was proud to achieve the recognition and status. The city is the eighth smallest in the UK in terms of population, city council area and urban area. Truro is twinned with Boppard, in the Rhineland-Palatinate region of Germany, and Morlaix in Brittany, France, after which Morlaix Avenue in Truro is named. Truro in the Canadian province of Nova Scotia. Truro in the US state of Massachusetts. Truro is 6 miles (9.7 km) from the A30 trunk road, to which it is connected by the A39 leading from Falmouth and Penryn. 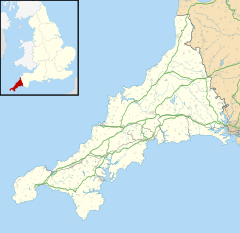 Also passing through the city is the A390, from Redruth in the west to Liskeard in the east where it connects to the A38, which then goes on to Plymouth and further to Exeter and the M5 motorway. Truro is the most southerly city in the United Kingdom, just under 232 miles (373 km) west south west of Charing Cross, London. The city and surrounding area are served by extensive bus services, mostly operated by First Kernow with routes across the city, and in and out of the city in all directions, mostly starting and terminating at Truro bus station near Lemon Quay.A permanent Park and Ride scheme, known as Park for Truro, began operation in August 2008. Based at Langarth Park in Threemilestone, buses carry commuters into the city centre via Truro College, the Royal Cornwall Hospital Treliske, County Hall, Truro railway station, the Royal Cornwall Museum and Victoria Square, and now through to a second car park on the east side of Truro. Longer-distance coaches run by National Express also operate from Truro. Carvedras Viaduct, built in 1859 by Isambard Kingdom Brunel. It was replaced by a stone viaduct in 1904. Truro railway station is about 1 km (0.6 mi) from the city centre and is on the Cornish Main Line, giving the city a direct connection to London Paddington, as well as to the Midlands, North and Scotland. North-east of the station is a 28-metre-high (92-foot) stone viaduct with expansive views over the city, cathedral, and Truro River in the distance. The viaduct—the longest on the line—replaced Isambard Kingdom Brunel's wooden Carvedras Viaduct in 1904. Connecting to the main line at Truro station is the Maritime Line, a branch line to Falmouth in the south. Truro's first railway station was at Highertown, which was opened in 1852 by the West Cornwall Railway and from where trains ran to Redruth and Penzance. It was known as Truro Road Station; it was just west of Highertown Tunnel on the up side. The line was extended to the Truro River at Newham in 1855 Then Truro Road Station closed and Newham served as the terminus. When the Cornwall Railway connected the line to Plymouth, their trains ran to the present station above the city centre. The West Cornwall Railway (WCR) then diverted most of its passenger trains to the new station, leaving Newham mainly as a goods station until it closed in 1971. The WCR became part of the Great Western Railway. The route from Highertown to Newham is now a cycle path, which takes a leisurely loop through the countryside on the south side of the city. The steam locomotive, the City of Truro, was built in 1903 and still runs on UK mainline and preserved railways. There is also a boat link to Falmouth along the Rivers Truro and Fal, four times daily, tide permitting. The small fleet run by Enterprise Boats and part of the Fal River Links stops on the way at Malpas, Trelissick, Tolverne and St Mawes. The old parish church of Truro was St Mary's, incorporated into the cathedral in the later 19th century. Parts of the town were in the parishes of Kenwyn and St Clement (Moresk) until the mid 19th century when other parishes were created. St George's church in Truro, designed by the Reverend William Haslam, vicar of Baldhu, was built of Cornish granite in 1855; it is lofty and imposing. The parish of St George's Truro was formed from part of Kenwyn in 1846. In 1865 two more parishes were created: St John's from part of Kenwyn and St Paul's from part of St Clement. St George's contains a large wall painting behind the high altar which was the work of Stephany Cooper in the 1920s. Her father Canon Cooper had been a missionary in Zanzibar and elsewhere. The theme of the mural painting is "Three Heavens": the first heaven has views of Zanzibar and its cathedral (a happy period in the life of the artist); the second heaven has views of the city of Truro including the cathedral, the railway viaduct and St George's church (another happy period in the life of the artist); the third heaven is above the others which are separated from it by the River of Life (Christ is represented bridging the river and 17 saints including St Piran and St Kenwyn are depicted in this part). Charles William Hempel was organist of St. Mary's Church for forty years from 1804, supplementing his income by teaching music. In 1805 he composed and printed Psalms from the New Version for the use of the Congregation of St. Mary's, and in 1812 Sacred Melodies for the same congregation. These melodies became very popular. The oldest church in Truro is at Kenwyn, on the northern side of the city. It is from the 14th/15th centuries. St John's Church (dedicated to St John the Evangelist) was built in 1828 (architect P. Sambell) in the Classical style on a rectangular plan and with a gallery. Considerable alterations were carried out in the 1890s. St Paul's Church was built in 1848. The chancel was replaced in 1882–84, the new chancel being the work of J. D. Sedding. The tower is "broad and strong" (Pevsner) and the exterior of the aisles are ornamented in Sedding's version of the Perpendicular style. In the parish of St Paul is the former Convent of the Epiphany (Anglican) at Alverton House, Tregolls Road, an early 19th-century house. The house was extended for the convent of the Community of the Epiphany and the chapel was built in 1910 by Edmund H. Sedding. The sisterhood was founded by the Bishop of Truro, George Howard Wilkinson, in 1883 and closed in 2001 when the two surviving nuns moved into care homes. The sisters were involved in pastoral and educational work and the care of the cathedral and St Paul's Church. St Paul's Church, built with a tower on a river bed with poor foundations, has fallen into disrepair, and is no longer in use. Services are now held at the churches of St Clement, St George, and St John. St Paul and St Clement are now a united benefice, as are St George and St John. Only one of Methodist chapel remains in use, in Union Place (Truro Methodist Church), which has a broad granite front (1830, but since enlarged). There is a Quaker Meeting House built in granite (c. 1830) and numerous other churches, some meeting in their own modern buildings, e. g. St Piran's Roman Catholic church and All Saints, Highertown, and some in schools or halls. St Piran's, dedicated to Our Lady of the Portal and St Piran, was built on the site of a medieval chapel by Margaret Steuart Pollard in 1973, for which she received the Benemerenti Medal from the Pope. The Baptist church building occupies the site of the former Lake's pottery, one of the oldest in Cornwall. Truro School — a public school founded in 1880. Truro High School for Girls — a female-only public school, for ages 13–18. Penair School — a state school, co-educational science college, for children aged 11–16. Richard Lander School — a state school, co-educational technology college, for children aged 11–16. Truro College — A further and higher education college. Part of the Combined Universities in Cornwall. The former Truro Girls Grammar School was converted into a Sainsbury's supermarket. As of 2008[update] major changes are also proposed for the city centre, such as pedestrianisation of the main shopping streets and beautification of a list of uncharacteristic storefronts built in the 1960s. Also, new retail developments on the current Carrick District Council site and Garras Wharf waterfront site will provide more space for shops, open spaces and public amenities and also turn rather ugly areas of the city into attractive new destinations. Along with the redevelopment of the waterfront, a tidal barrier is planned to dam water into the Truro River which is currently blighted by unsightly mud banks which appear at low tide. Controversial developments include the construction of a new stadium for Truro City F.C. and the Cornish Pirates, and the relocation of the city's golf course to make way for more housing. A smaller project is the addition of two large sculptures in the Piazza. Edward Boscawen (1711–1761), Royal Navy admiral. A cobbled street at the centre of Truro and a park are named in his honour. John Vivian (1750–1826) became an influential industrialist in Swansea (see Vivian family). Henry Martyn (1781–1812), Cambridge mathematician and missionary in India and Persia, who translated the Bible into local languages. Richard Spurr (1800–1855), cabinet maker and lay preacher imprisoned for his part in leading the political movement of Chartism. A large allotment in the town was dedicated to his memory in 2011. Richard Lemon Lander (1804–1834), an explorer in West Africa. A local secondary school is named in his honour and a monument to his memory stands at the top of Lemon Street. Richard Lemon Lander. A monument to him stands at the top of Lemon Street. Silvanus Trevail (1851–1903) local architect and mayor of Truro. Maria Kuncewiczowa (1895–1989), Polish writer living in Truro after World War II. Her novel Tristan 1946 was set here. William Golding (1911–1993), novelist, playwright and poet born in St Columb Minor, who returned to live near Truro from 1985 until his death. Alison Adburgham (1912–1997), social historian and fashion journalist, died in the town. ^ Padel, O. J. (1988) A Popular Dictionary of Cornish Place-names, Penzance, A. Hodge ISBN 0-906720-15-X. ^ Parochial history of Cornwall, Davis Gilbert. ^ De Lucy in the 12th century, Norman Lucey 2009 [lucey.net/webpage62.htm]. ^ Pascoe, W. H. (1979). A Cornish Armory. Padstow, Cornwall: Lodenek Press. p. 135. ISBN 0-902899-76-7. ^ "History of Truro". Truro Town Site. Archived from the original on 10 April 2008. Retrieved 13 January 2008. ^ "Wanted, recruits for the Duke of Cornwall's Light Infantry. Young Men apply to J. G. Myners, New Bridge-street, Truro". Royal Cornwall Gazette. 14 August 1890. Retrieved 27 August 2017. ^ a b "Census 2001 Key Statistics for urban areas in England and Wales" (PDF). National Office of Statistics. Archived from the original (PDF) on 4 May 2017. Retrieved 13 January 2008. ^ "Homes in smaller cities cost more". BBC News. 20 May 2006. Retrieved 13 January 2008. ^ "Building Statistics – Truro Cathedral, Truro". Emporis. Retrieved 13 January 2008. ^ "Daytripper – Sheer Indulgence in Truro". Truro City Council. Archived from the original on 7 October 2007. Retrieved 13 January 2008. ^ "Schools and Groups – Truro City of Lights". www.cityoflights.org.uk. ^ "Truro City of Lights parade 2010". 4 November 2010 – via news.bbc.co.uk. ^ Rees, Paul (17 April 2018). "Stadium for Cornwall moves step closer with £3m of council funding". the Guardian. ^ "Renewed hope for sports stadium". BBC News. 21 December 2007. Retrieved 13 January 2008. ^ "Truro Fencing Club". Truro Fencing Club. Retrieved 3 January 2019. ^ "FindArticles.com - CBSi". Archived from the original on 30 August 2004. Retrieved 13 November 2016. ^ "Truro [Formerly Mylor]: "A Play for Christmas", 1780s". folkplay.info. ^ Archive, The British Newspaper. "Register | British Newspaper Archive". www.britishnewspaperarchive.co.uk. Retrieved 11 August 2018. ^ "BBC – Cornwall – Faith – Festival of Nine Lessons and Carols". www.bbc.co.uk. Retrieved 11 August 2018. ^ "Camborne 1981–2010 averages". Met Office. Retrieved 4 November 2012. ^ "Camborne extremes". KNMI. Retrieved 8 November 2011. ^ "Councillors & Wards". Truro City Council. Archived from the original on 28 September 2007. Retrieved 13 January 2008. ^ "Home - Truro City Council". www.truro.gov.uk. Retrieved 3 September 2017. ^ Committee, Great Britain: Parliament: House of Commons: ODPM: Housing, Planning, Local Government and the Regions (2006). Is There a Future for Regional Government? : Session 2005-06. The Stationery Office. ISBN 9780215027849. ^ Council, Cornwall. "Council and democracy – Cornwall Council". www.cornwall.gov.uk. Retrieved 3 September 2017. ^ Truro, Totally. "Work and business: Truro City Council | enjoy truro". www.enjoytruro.co.uk. Archived from the original on 3 September 2017. Retrieved 3 September 2017. ^ Association, "Come to Cornwall" (1960). City of Truro, Cornwall: Official Guide, Issued in Support of the "Come to Cornwall" Movement Under the Authority of the Truro City Council and the Truro Chamber of Commerce. ^ "Crime and Punishment - Truro Uncovered". www.trurouncovered.co.uk. ^ Beckett, John (2017). City Status in the British Isles, 1830–2002. Taylor & Francis. ISBN 9781351951265. Retrieved 3 September 2017. ^ "Truro Cathedral". Cornwall Guide. 6 December 2015. Retrieved 3 September 2017. ^ "Aims of Twinning". Truro-Morlaix Twinning Association. Retrieved 10 May 2010. ^ "Newquay is officially the UK's fastest growing airport". The Independent. Retrieved 3 October 2018. ^ "Parishes of St Paul, Truro, St Clement, St George, Truro, and St John, Truro (united benefice)". Truro Churches (official). Retrieved 15 December 2009. ^ Polly Bagnall & Sally Beck (2015). Ferguson's Gang: The Remarkable Story of the National Trust Gangsters. Pavilion Books. p. 10. ISBN 978-1909881716. ^ "University of Exeter". Retrieved 13 November 2016. ^ a b c d "Truro and Threemilestone Action Plan". Carrick District Council. Archived from the original on 20 December 2008. Retrieved 13 January 2008. ^ "The Lemon Quay Sculptures". Truro City Council. Archived from the original on 28 September 2007. Retrieved 13 January 2008. ^ Shepherd, Matt (5 January 2015). "Silvanus Trevail". BBC. Retrieved 31 August 2015. ^ "Joseph Hunkin in New York". Time Inc. 14 February 1938. Retrieved 20 March 2009. Wikimedia Commons has media related to Truro. Wikivoyage has a travel guide for Truro (England).